A North Korean soldier made a dramatic escape to South Korea through the military demarcation line at the Joint Security Area on November 13. The defector, who was later identified as a 24-year-old man, was driving a military jeep to cross the 72-Hour Bridge, the only available route that connects to the Joint Security Area. The vehicle continued on to pass the “Monument of Signature,” a memorial bearing Kim Il-sung’s own signature, before the vehicle got stuck on a drain. After multiple failed attempts to free the vehicle, the soldier got out and ran desperately toward the South. Four North Korean guards gathered, drawing out their guns and firing at the escapee. More than 40 rounds were fired at the defector as he fled. Soon after, he was found collapsed near a wall west of the Freedom House, where he was rescued by two South Korean non-commissioned officers while a battalion commander covered for them. He was transported by a United Nations Command helicopter and was evacuated to Ajou University Hospital in Suwon for medical treatment. The man was in serious condition after he was shot in more than five places, including the stomach, right side of the pelvis, both arms, and legs. After a series of surgeries, however, he has pulled through. On November 18, the sixth day since the escape, he was able to breathe on his own. By November 20, he had regained consciousness. It was revealed after the surgery that the defector was shot at with AK rifles, the possession of which within the confines of the Joint Security Area is a clear violation of the Korean Armistice Agreement, which marked the effective end of the Korean War in 1953. The agreement explicitly prohibits the possession of heavy firearms in areas including the Demilitarized Zone and the Joint Security Area. Additionally, one of the four North Korean guards who went after the defector was caught on closed circuit television crossing the military demarcation line fully armed and continuing on for several meters, before jerking to a halt and retreating back to the North’s side of the border. Colonel Chad G. Carroll, public affairs director of the United Nations Command, said at a briefing that this act was a violation of the Armistice Agreement “by actually crossing the military demarcation line temporarily.” Shooting across the military demarcation line was also noted as a serious violation of the agreement. South Korea’s loudspeaker broadcasting has been a serious issue for North Korea, which corroborates the argument that it is indeed effective in demoralizing North Korean listeners. In August 2015, South Korea restarted the loudspeaker broadcasting system for the first time in 11 years as a protest against North Korea’s use of land mines, which had injured two South Korean soldiers. In response, North Korea reacted by firing anti-aircraft artillery. The loudspeakers were temporarily shut down after the August 25 agreement, before going back to operation after North Korea’s fourth nuclear test, which occurred last January. After the most recent defection, North Korean workers were found near the site where the defector’s military jeep got stuck. They were seen digging at least a meter deep trench and planting two trees around it, so as to strengthen border protection. 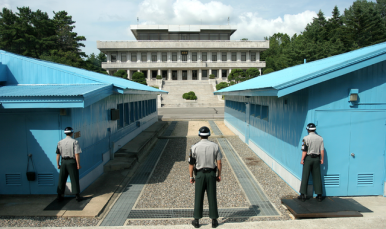 All North Korean guards in the Joint Security Area have also been replaced. Once the defector recovers to a stable condition, there will be a joint questioning led by the National Intelligence Service and Defense Security Command to investigate the defector’s identity as well as the intent of his escape.